Great for Food service, Freezers/Commercial coolers, Outdoor lighting, Drop lights, Construction sites. "Safety coated glass for shatter resistance provides a protective shield to safely contain the glass if the bulb should break"
When safety is a concern, shatter resistant light bulbs are the only option. 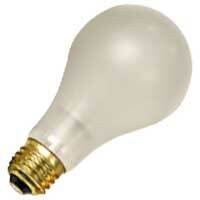 These bulbs are silicone coated to prevent glass shards from contaminating food or creating other hazards. Incandescent lamps have been the tried and true way of lighting the world since Edison invented the light bulb in 1879. Shat-­R­-Shield offers an extensive selection of incandescent lamps, including everything from industrial service lamps, vibration service and rough service lamps, infrared heat lamps, reflector lamps, all the way down to decorative incandescent lamps. If a Shat-R-Shield incandescent lamp is accidentally broken, virtually all glass is safely contained within the skin-tight plastic coating. Shat-R-Shield’s shatter-resistant incandescent lamps are transparent, allowing more lumen output and range of vision. The specialized, clear and tough plastic coating has excellent long-term resistance to extreme heat or cold (hot grease and welding spatters, rain, snow, etc.) and is unaffected by ultraviolet (UV) light. If used properly under warranty criteria, the coating is guaranteed not to yellow, crack or flake for the rated life of the lamp. As legislation set forth by the US Department of Energy’s Energy Independence and Security Act (EISA) phases out inefficient higher wattage incandescent lamps, Shat­-R­-Shield continues to supplement their offering by adding higher efficiency, lower wattage versions as replacement options.